Aizawl, Feb. 11 (PTI): Security has been tightened in view of the ‘Black Day’ protests scheduled to be observed by the civil societies in Mizoram Today against the contentious Citizenship Amendment Bill, a senior police officer said. NGO Coordination Committee leaders said that ‘black day’ would be observed in view of the Centre’s intention of passing the proposed amendment to the Citizenship Act, 1955 during the week in the Rajya Sabha. The leaders said that stir would be intensified if the Rajya Sabha passes the amendment Bill. The Bill has created a furore in Mizoram and kicked up a storm in the northeast. The Bill was passed by the Lok Sabha on January 8 and has been awaiting the Rajya Sabha nod. Indigenous people of the region are afraid that identity would be lost if the Bill was enacted. 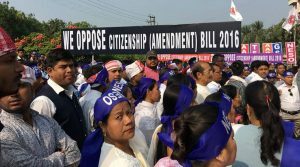 The civil societies are apprehending that the Bill would endanger the very existence of the sons of the soil — Mizos — as citizenship to around 1 lakh Buddhist Chakmas from Bangladesh would be granted. Meanwhile, all the political parties, including the ruling Mizo National Front (MNF) and even the state BJP unit have expressed opposition to the proposed legislation. MNF leader and Chief Minister Zoramthanga has said that the ruling party would not hesitate to snap ties with the National Democratic Alliance (NDA) and BJP-led North East Democratic Alliance (NEDA) if the Bill is passed. State BJP Chief John V Hluna also warned that the state unit of the saffron party would be dissolved if the central leadership goes ahead with the proposed amendment.